17 May 2018 – Power supplies, how good is yours? Bryan, M0BIK opened the evening with a slide show explaining the ins and outs of conventional power supplies. The choice of components was discussed as to which were better for various applications. It was noted that the later use of toroidal transformers meant a unit of less weight could be made which was more efficient. Various circuit diagrams were discussed with reference to good and not so good practice in design. Don, G4LOO then took the floor and said he was going to tell about cheap power supplies. 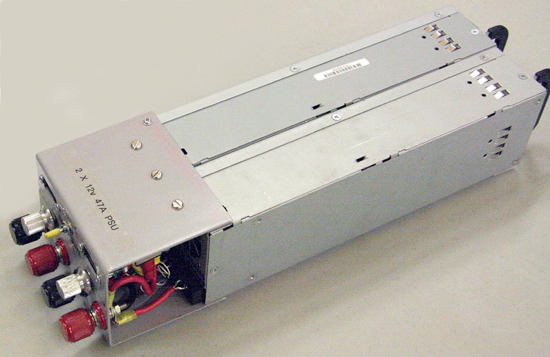 His units are based on surplus or second hand server power supplies. They can be found at very low cost from time to time on popular auction sites. Most will provide 12V or possibly up to 12.3V if modified slightly and produce an attention getting 47Amps! Other very small power supplies and converters from the same sites were passed around for members to check. Paul, G1GSN, then finished by displaying his ‘portable’ LPG gas/petrol generator which was about the size of a suitcase and produced mains voltage. Paul explained the benefits of using LPG outweigh that of petrol in that you are not limited to the size of the petrol tank, just use a larger bottle of LPG.. The gas is more efficient, as well, running for a longer time without topping up. This power unit was much larger than any other shown on the evening, though. Previous Post10 May 2018 – Video EveningNext Post90th Birthday!